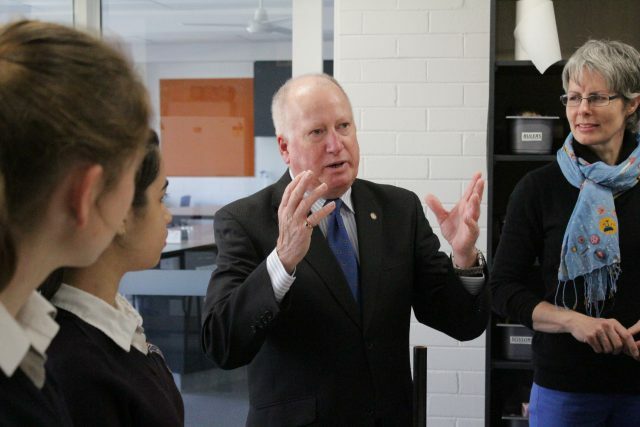 ACT Minister, Mick Gentleman, at Merici College. Photo supplied. Merici College was pleased to welcome ACT Minister Mick Gentleman in September for a tour of their Makerspace and to meet some of the engineering students. Among his portfolio of responsibilities, Minister Gentleman is the Minister assisting the Chief Minister on Advanced Technology and Space Industries. He spoke to the students about the ACT’s bid to host the Australian Space Agency and its push to strengthen the existing hub of space-related industries and testing and education facilities in the territory. He also mentioned Canberra’s significant place in space exploration as the location of the historical Honeysuckle Creek and Orroral Valley tracking stations and the current Tidbinbilla tracking station, and talked about his personal connection with that history. The students explained aspects of their current rocketry projects to the Minister, highlighting some of their rocket component designs that were being constructed on Merici’s 3D printers!